Satoshi Kon’s manga Opus was never completed. Satoshi Kon’s (1963-2010) career was cut too short when he died of pancreatic cancer, at the age of 46. He is best known for directing such anime masterpieces as Paprika (2006), Tokyo Godfathers (2003) and Perfect Blue (1997). It has been largely overlooked that before moving into anime Kon made some very high-quality mangas. His mangas have not been easily available, but they have been dug up again in Japan after his death. Kon’s only completely own and finished manga series was Kaikisen (Tropic of the Sea, 1990). Kodansha will publish a new edition in January 2011. Kodansha is also publishing a collection of short manga Yume no kaseki Satoshi Kon zen tanpen (”Fossilized dreams – All Satoshi Kon’s Short Stories”). It includes Kon’s first work Toriko (”Prisoner”) from 1984. 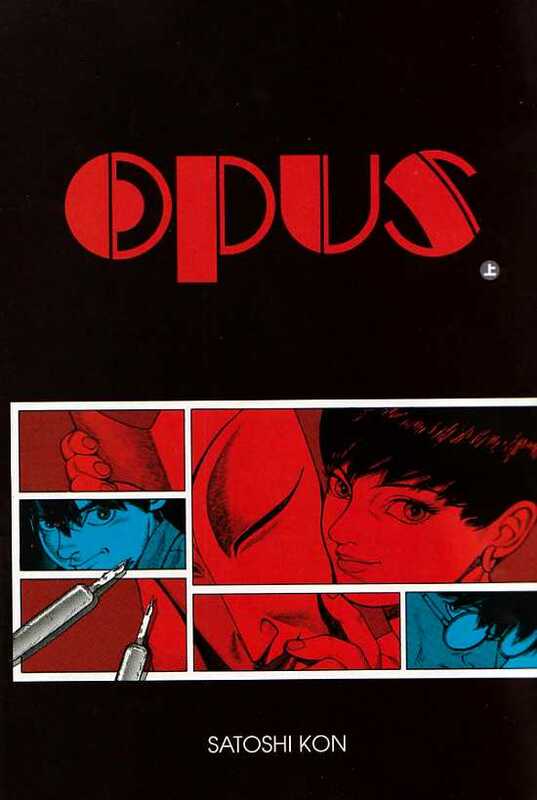 Before Christmas Ryu Comics published Opus as two paperback books, as well as Seraphim 2 oku 6661 Man 3336 no Tsubasa (”Seraphim – 266 613 336 wings”, 1994), which was made together with Mamoru Oshii. I bet that also some Western manga publisher will wake up during the year 2011 and find Satoshi Kon’s works. And even though high quality graphic novels seldom sell well, these should be published. One could easily market them with the reputation of an anime master. OPUS was published in Komikku gaizu (Comic Guy’s) magazine from October 1995 to June 1996. Kon drew 18 chapters (about 350 pages), which have now been re-released as two paperbacks in the series Ryu Comics Special. How the story would have continued will remain a mystery. The film career took all of Satoshi Kon, and the manga was never completed. 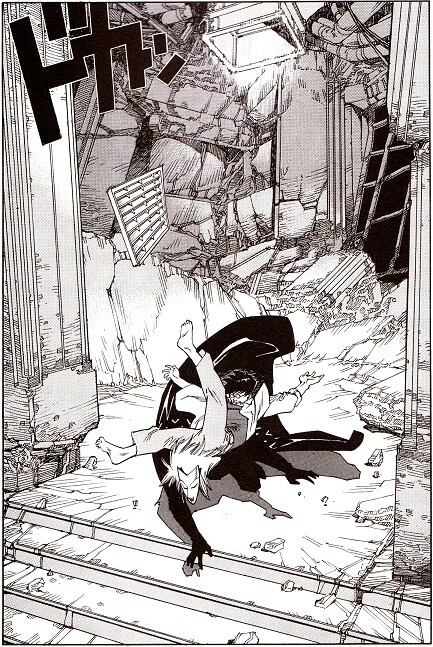 Opus begins with a scene from a manga called Resonance, which is created by Chikara Nagai. A young woman called Satoko and an even younger boy Rin defend themselves against a masked attacker. With the powers of the masked enemy, the city walls are demolished like a house of cards. Then the story moves into the cartoonist’s reality. Chikara Nagai is a ”typical” manga artist: His life is just plain hard work drawing manga. He lives in a cramped home-office with his assistant, and the only moments of relief are meetings with the editor. And then things begin to happen. Suddenly a cartoon frame opens as a pit, through which Rin steals a drawing showing his own death. 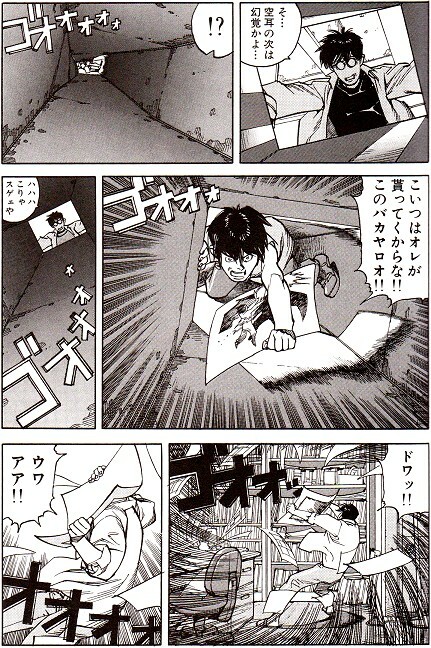 The manga artist jumps after Rin, and he falls into the chaotic world of Resonance. Opus proceeds in two worlds. 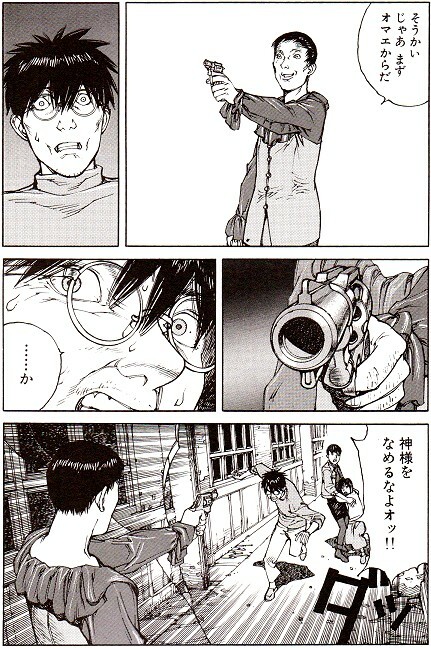 Nagai is involved in a war in the strange world of Resonance. Manga characters pop up into Nagai world. Forth and back, a ferocious cat-and-mouse-game with the masked enemy follows. …and the artist falls on a character he created. SATOSHI Kon’s story flows like a master composer’s symphony. He has the knack of pacing the story with scenes serene and and scenes full of action. Skillfully he also creates a rhythm between small events and huge ones. Kon knew exactly when the reader has to be given more information and when more uncertainty. He understood how to scare the reader or how to force the reader to ponder what is right or wrong. He also knew when the reader has to to be rescued with laughter. The idea of ​​dropping the manga artist into his own manga may seem trite. In Satoshi Kon’s hands it definitely is not. Kon developed it into a magnificent fabric of human relations and morality. The reckless manga artist Nagai is forced to ponder how badly cartoonists actually may treat their fictional characters. Should they too have some human / cartoon character rights? How does it really feel like to be chased, torn and exploded? What does a child murderer really think, and what do think his terrified victims? What does it actually mean to send someone to his death? How does it feel to fall in love with a character you have created? Kon was an outstanding illustrator and visualist. His manga characters are natural and behave according to their personalities. His urban manga landscape lives and breathes like Gotham City. In particular, I liked the transitions between the two worlds, which Kon created with a very wide range of visual tools. Sometimes the border between realities is broken like glass, sometimes it vanishes like sand in the wind. Sometimes real holes are cut between worlds, and sometimes reality can be changed with a pen. But can te artist protect the women of his fiction? IF Satoshi Kon would have continued his manga career, he would have been a true master of manga. Satoshi Kon’s animated movies are great, but still I’m not quite certain whether it was a good thing that he moved from manga to anime. I think that after Satoshi Kon, very few manga artists (of whom one is Naoki Urasawa) have created seinen of the quality that Kon reached.